Good morning! This weekend flew by in a flash but I managed to make the most of it. Saturday, I spent the entire day with some of my crafty girlfriends. I hadn’t seen them since last spring and many since last winter so this reunion was really special. Life kind of has a way of keeping us busy and my schedule which revolves around my family and work didn’t seem to make room for fun with my friends. However, now that the boys are back in school and we are falling into routines, I will be able to make time to be with my friends. 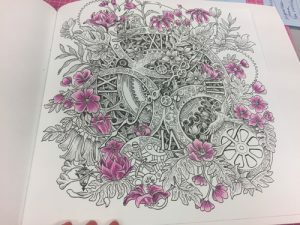 The first picture is of a page in the Fantomorphia coloring book by Kerby Rosanes. 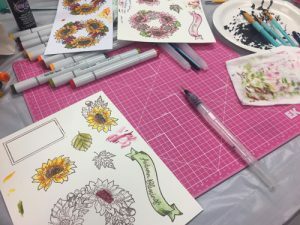 I had already begun coloring the flowers in the picture when I saw a few people on YouTube showing pages that they used acrylic paint on their coloring book pages. So I couldn’t resist trying. I brought my paint and an assortment of brushes to ensure I had the tools to give it a go. 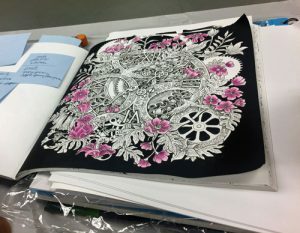 I saw others use black and I thought that it would really make the gears and flowers pop. I didn’t dilute the paint before applying it to the page. As I was completing the painting, I realized that a second coat was necessary to hide all of the brush marks. This technique is a great way to cover a background on a page quickly and then use the black colored pencil for tiny spaces. I have to say that I love the result and I know that this might not work well in all coloring books, but the pages in the coloring book series are thick and no bleeding through occurred. I only used a blank piece of cardstock behind the page as I painted so that I wouldn’t get any on the desk or the next page. Now I am so excited to paint more pages in this book! As part of my quarterly business purchases, I have bought quite a few new stamp sets and this fall set simply makes me happy. You all know how much I love autumn so I was eager to play with this new set. I stamped them up on Copic paper and watercolor paper to explore the different results. I absolutely love both versions. I even googled and found pink sunflowers so you know I had to take the opportunity to color up some pink sunflowers! I had a great time catching up with my friends and left feeling filled up with joy. I work from home so it is very important for me to make time to get out with friends and socialize. So this time was priceless and I look forward to the next. Next PostNational Read an Ebook Day! It was wonderful to get to spend some crafty time with you! Hopefully you can make it again soon!